Unlike my last recipe re-do, where I wasn't thrilled with the original recipe, the starting recipe this time around is actually really good. 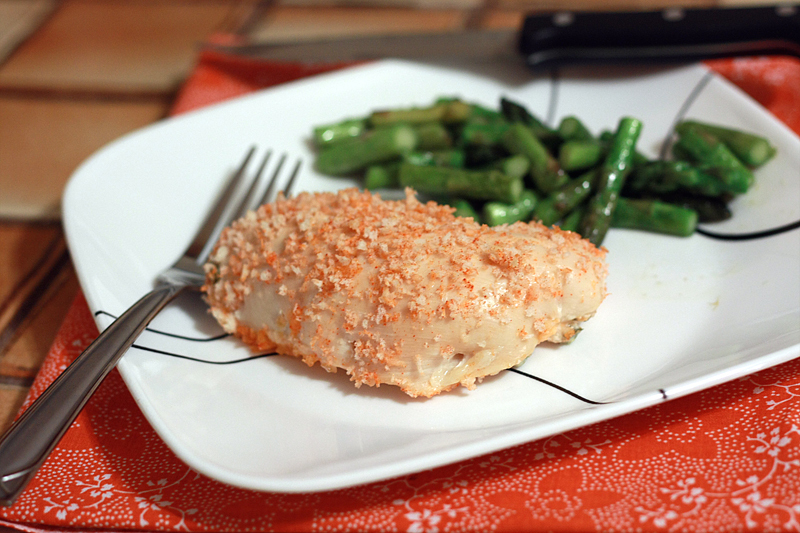 This Garlic Lemon Double-Stuffed Chicken is a hot mess of gooey cheese and buttery crunchy breadcrumbs. Kind of hard to add or take away anything from that without losing the essence of the dish. After struggling with this dilemma for a long time, a quick look at the nutrition facts made the decision for me. Clocking in at over 900 calories per serving is really quite a bit ridiculous. Especially when we're talking chicken. What to do? The cheese has to stay -- it's what makes the dish! Instead, I omitted the butter, used reduced-fat cream cheese, and less cheddar -- shredding it instead of using a slice so I felt like there was still the same amount. A 400 calorie reduction later, and we now have a dish that went from a "special indulgence" to acceptable for dinner almost any night. Preheat oven to 350 degrees F. Thoroughly coat a 8x8 baking pan with cooking spray; set aside. In a small skillet over medium heat, cook the jalapeno for 3 minutes. Add the garlic and cook for an additional 2 minutes. Remove from heat and transfer to a small bowl. Add the cream cheese and mix together until the jalapeno mixture is fully incorporated. Set aside. Using a sharp knife, slice each chicken breast in half horizontally through the center (butterfly), cutting almost but not completely through. 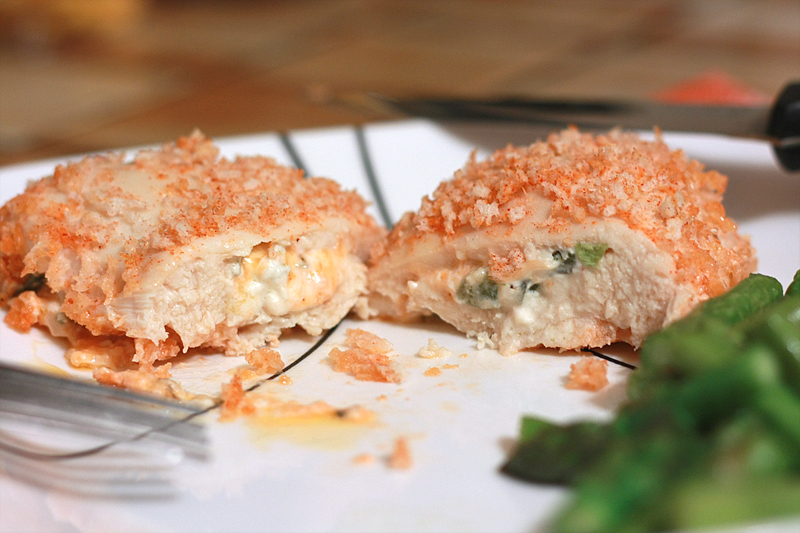 Spread half the cream cheese mixture on the inside of a chicken breast. Sprinkle with 2 tablespoons of cheddar, then fold the unused half of the chicken breast back over, securing with toothpicks. Repeat with remaining chicken breast and cheese. Pour milk into a shallow bowl. In another small bowl, toss together the panko and paprika. 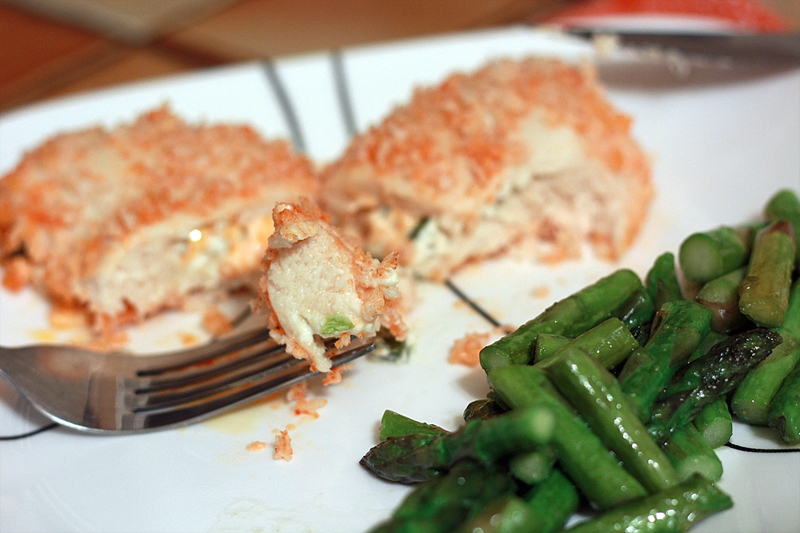 Dip each stuffed breast in milk, then roll gently in breadcrumb mixture, patting lightly to coat. Place breasts in the prepared baking dish. Bake for 25-30 minutes, or until chicken is no longer pink and juices run clear. I was a little leery at first dumping a whole jalapeno into the cream cheese for just two chicken breasts, but the cream cheese really mellows it out. It remains spicy, but definitely not overpoweringly so. I also really like that subtle hint of smokiness from just that little touch of smoked paprika -- it gives the chicken that extra little nuance of flavor. Adam and I both gave this two thumbs up, and I really wished I had made more that just two chicken breasts so we could have leftovers the next day. 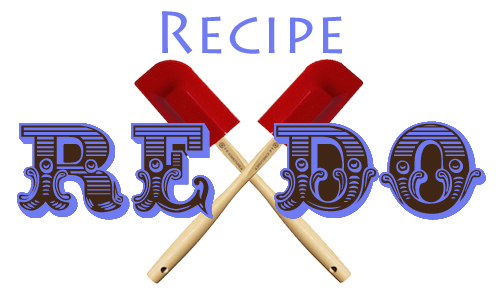 Interested in my previous Recipe Re-Dos? Delicious!! Love that you took away 400 calories, and it is still good! Love the lightened version, it looks delicious! You had me at cheesy chicken! This chicken sounds fabulous! Great re-do! 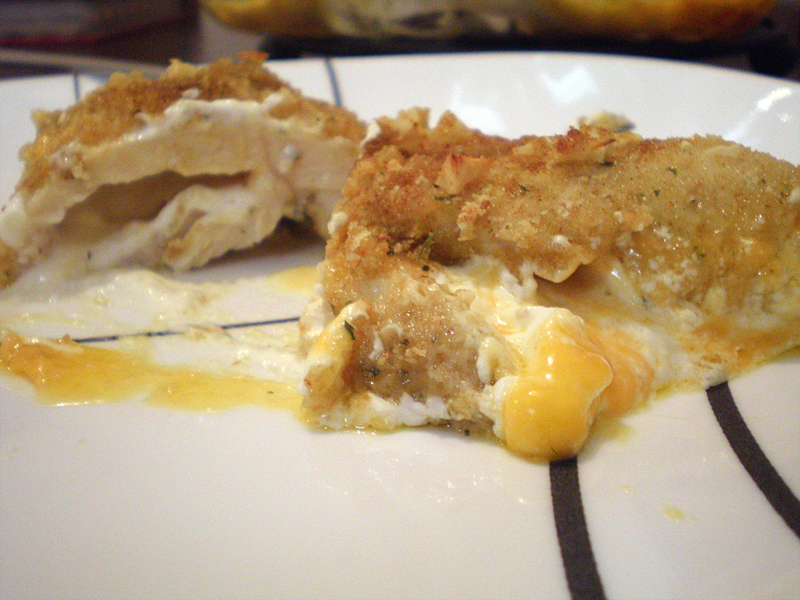 Lovely coating of the cheese on the chicken, nice outcome after the re-do. I just made this last night for my boyfriend and I - YUM! (and he's a picky eater!).... it will be on the rotation for sure!